Lancaster, Pa. — A new battery energy storage system is now online at the Atlantic County Utilities Authority’s wastewater treatment plant in Atlantic City, N.J. The system captures up to one megawatt hour of energy produced by the site’s 7.5-megawatt wind farm and 500 kilowatts from solar panels, storing it to be used when needed. It was formally opened with a ceremony held April 16. 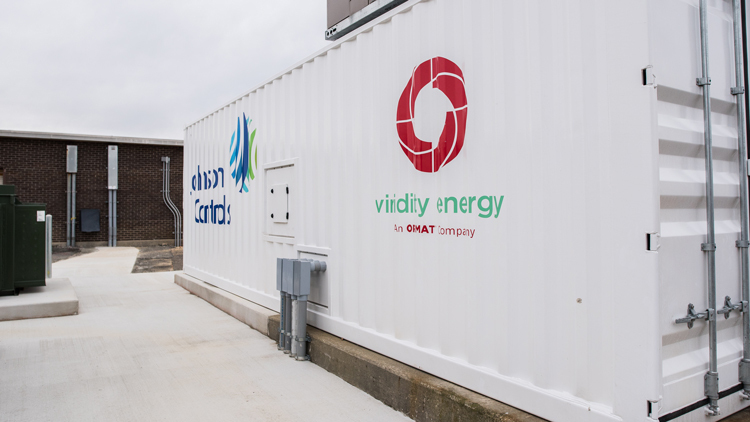 Viridity Energy Solutions Inc., an Ormat Company, will own and operate the battery system for 20 years. The system combines advanced energy storage with Viridity’s VPower energy management software. The New Jersey Board of Public Utilities awarded a $417,000 grant to help fund the project. During times of high energy demand, the battery system will help power the authority’s operations, thereby lowering the cost of electric supply at the wastewater facility. The battery system will also enable the authority to be an ancillary support to the region’s electric grid, creating an additional revenue stream for its operations. Using energy from the battery storage system is an emissions-free energy choice, and goes hand-in-hand with the authority’s other renewable energy installments, which also include several electric vehicle charging stations. Viridity was the general contractor and led the engineering procurement and construction efforts on the project. Johnson Controls provided the battery storage system, RETTEW served as the design-build manager and Calvi Electric was the electrical contractor. While the authority has invested in several renewable energy options, renewable power is limited by its intermittence. The battery storage project helps store electricity generated when it’s not needed and then draw on that energy at times when it is. The system will help balance the supply and demand of the region’s electric grid.